Makes a wonderful rich tasting, rich in history, dark bean and ham-hock casserole. As Boy Scouts, we went on many a week-end camping trip. Parents would drop us off about five miles from where we were to camp. They would take the cars with the heavy camp gear to the camp site. We back-packed our personal gear the five mile to camp. One of the items we usually sent along with the car was Dutch oven full of Bean Hole Beans ready to go into the fire pit. As soon as we got to camp, we would build the fire pit and put the Dutch oven into the ground. The next day we had a wonderful meal waiting. Personally, there is a lot more to the history of the Bean Hole Beans but that is for another night. Sort, inspect and cull beans removing any forign material. Place in cold water for 24 hours. Allow enough water for the beans to almost double in size. After soaking, drain water, place in a large pot and cover with water. Allow enough water for the beans to increase in size again. Heat, bring to a boil and then simmer for 1 hour. Drain; set aside. In frying pan, sauté onions and green peppers until; onion is transparent. Add tomatoe sauce, diced tomatoes and ham hocks. Bring to a simmer and then add the spices, molasses and brown sugar. Stir well, mixing all ingredients. Allow to simmer for 5 minutes. 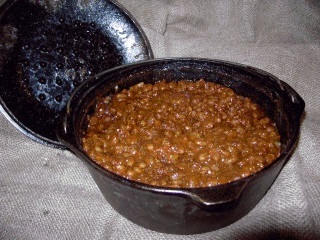 Place drained beans in cast iron Dutch oven. Add sauce and ham hocks. Stie well to coat all of the beans with the sauce. Cover with lid. To Can: Place beans and sauce in Dutch oven and cover. Cook in preheated oven at 250°F. for 4 hours. Then bottle beans using sterile practice. Process in pressure cooker at 10 pounds pressure for 75 minutes for pint jars or 90 minutes for quart jars. To Cook In Oven: Place beans and sauce in Dutch oven with cover. Bake in oven at 250°F. for 4 hours then reduce temperature to 200°F. for 10 hours. To Cook Imu Style (Bean Hole Beans, right? ): Place beans and sauce in Dutch oven. Cover securely. Put Dutch oven in prepared fire pit coals. Cover with wet burlap sack, cover with coals then with dirt remembering to make fire breathing hole with stick. Cook overnight or for about 12 hours.